She stood in front of the dusty spines of her perfectly arranged self-procured library. Sorted alphabetically by author and then by height, most had not been opened since her university days. She used to believe in ‘not reading a book twice’, she felt it was a waste of time. Why re-read a book that never changes? But here she stood, wanting to revisit something from her past. After finally deciding on a classic, she retreated to her couch. As she began to turn the pages she quickly found that the book was in fact ‘different’, She noticed nuances she hadn’t on her first read, and both the characters and story seemed to hold new meaning. Through the coloured lenses of almost twenty years of life, the book seemingly had changed. This static piece of literary art had new meaning. She began to assess her theory about re-reading books. Our perception of art can change, because we change. Nothing will ever be the same twice, because we are never the same. 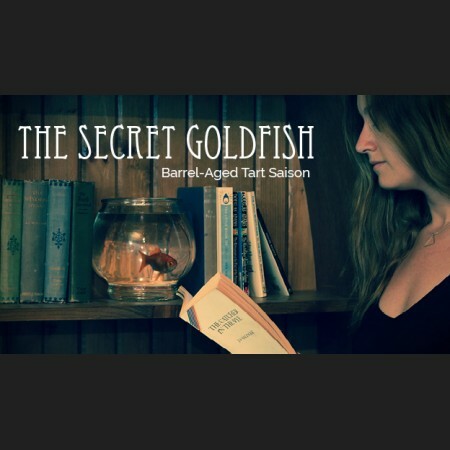 The Secret Goldfish is available now in a limited run of 750 ml bottles exclusively at the Sawdust City retail store, and on tap at select locations in Ontario.